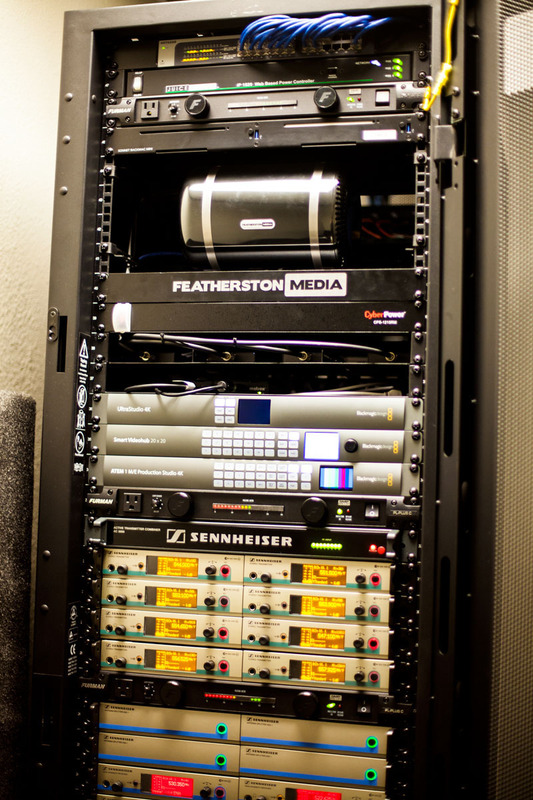 The A/V equipment rack at Koinonia Christian Church in Arlington, TX, featuring a variety of gear sourced through Guitar Center Professional and installed by GC Pro affiliate Featherston Media. Photo courtesy of Featherston Media. © 2015. A view of the stage and screen at Koinonia Christian Church in Arlington, TX, featuring a variety of gear sourced through Guitar Center Professional and installed by GC Pro affiliate Featherston Media. Photo courtesy of Featherston Media. © 2015. Photo caption 2: A view of the stage and screen at Koinonia Christian Church in Arlington, TX, featuring a variety of gear sourced through Guitar Center Professional and installed by GC Pro affiliate Featherston Media. Photo courtesy of Featherston Media. © 2015.